I recently had a week-long trip snorkeling from a liveaboard, The Reef Encounter, which is moored meters away from the Great Barrier Reef in Australia. From Cairns you take the day boat, The Reef Experience, and then transfer at sea onto The Reef Encounter. The vessel moves at least once a day for different snorkeling and diving adventures. Snorkelers and divers are treated equally and both groups get to see a lot. So this was great. As a solo person it was great and extremely safe. I was very well looked after - great staff, lovely room and facilities, on board chef and communal living area and lovely other visitors. I had at least 3-4 hours in the water per day. There are set times the sessions occur with excellent safety. A hot shower after and a snack or drink each time really helped keep up the strength. The last three days I went Top Deck and had Simon, my fabulous guide. So as I was concentrating on some small critter, he would tap me on the shoulder and point out more turtles, rays, sharks, Potato Cod that I wouldn’t have seen. I also got to ask him lots of questions so learned a lot about the marine life and the reef. I can't remember all the reefs we went to – but one was the Norman Reef, the other I think was Fitzroy and couple of others. The weather was overcast and swelly a few days but everyone still went in and the water clarity for 95% was very good to excellent. 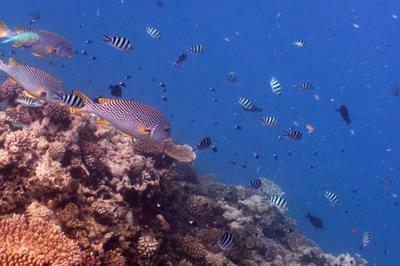 The variety of fish, coral, marine life was awesome. 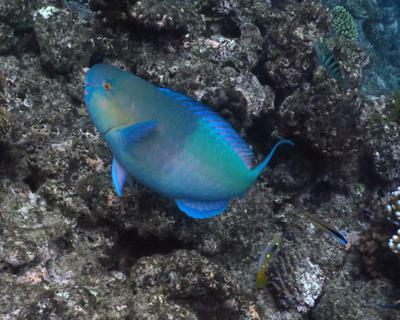 From a gang of 10 Bumphead Parrotfish about 2 meters from me, to several turtles over the days, Whitetip Reef Sharks, Titan Triggerfish a couple of days, either foraging or making a nest – not sure. Parrotfish close up munching on the coral and also being cleaned by cleaner wrasses, school of Sweetlip Grunts hanging out together, some awesome Batfish, and of course anemonefish, including my first seeing Nemo; I hadn’t realized how small these are. I usually don’t take a lot of interest about coral – my attention is to the fish – but the variety of corals was excellent and I have a greater appreciation of them and their fragility seeing them up so close. I live about 7 hours by air from the reef and wish I had gone many years ago. I will definitely be going back - awesome, awesome, awesome. 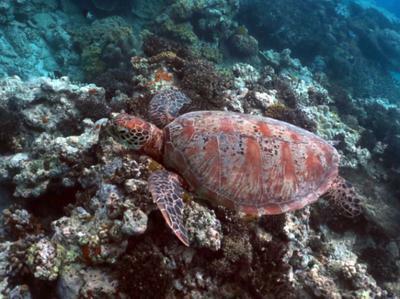 Sue, thank you so much for sharing your experience snorkeling the Great Barrier Reef from a liveaboard boat. Sounds fantastic!